It's taking its sweet time in doing so, but Apple has finally activated its Twitter account, just days before its iPhone 7 event kicks off on September 7. Apple has actually had a Twitter account since September 2011, but it has been sitting gathering dust with the default "egg" avatar all this time. It's now been given a fresh lick of paint though, with Apple filling out its details, popping in its logo and using the same image as its September 7 event invite for its background picture. So why the sudden love for Twitter? Noted Apple blogger Mark Gurman believes the company will be looking to live tweet its iPhone 7 launch, presumably in an attempt to steer messaging away from memes of Tim Cook sitting on an Irish pot of gold. It's looking like a thorough PR push from the company, which has also given its Newsroom press site a spruce up, making its home-brewed Apple news more easily accessible. As for followers, Apple's already rising up the ranks of big Twitter tech profiles with 109k followers in less than a day on the network. With a fair old headstart Samsung's racked up 5.35 million on its main US account, while Amazon sits a little lower on 2.4 million followers. 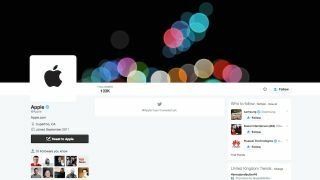 But for all the best unbiased tech coverage, you'll of course want to be following @techradar on Twitter instead.